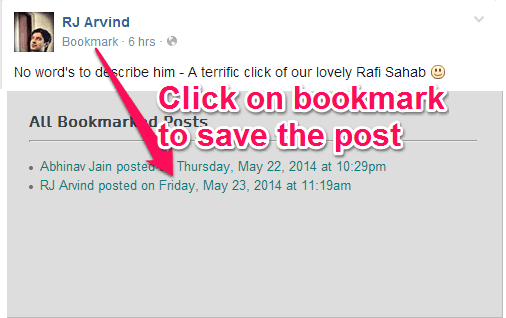 This tutorial explains how to bookmark Facebook posts. Many a times we come across Facebook posts that are quite informative and we would like to go back to them in future. Unfortunately, Facebook doesn’t provide any way to bookmark posts (though, there has been buzz about Facebook implementing this feature, but it has not happened till now). Thankfully, there are a few easy ways to bookmark Facebook posts that you like. Let’s go over them to see how you can go back to Facebook posts that you liked earlier. Every browser comes with a bookmarking feature that lets you bookmark any webpage. You can use that feature to bookmark Facebook posts as well. 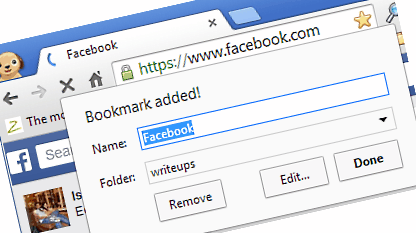 Bookmarking the posts is the simplest method to save your Facebook posts, so that you can view them later. Posts on Facebook can be easily bookmarked by these simple steps. Step 1: Click on the timestamp of the posts. Below every post, there is a timestamp that shows when the article was posted like: “2 hours ago”, “ten minutes ago”, “yesterday at 2.30 p.m” etc. Just tap on that and the post will opens in a separate page of its own. Step 2: Now use your browser’s bookmarking feature to bookmark that page (you can also just press Ctrl+D.. try doing on this page). Now the page of that post is bookmarked on your browser and you can go to it anytime you want. (If you bookmark lot of pages, you might want to check out one of these bookmarking plugins for Chrome). If you don’t want to go through the whole process of opening the post in a separate webpage and then bookmark it, then you would be happy to know that there are two Chrome extensions that let you directly bookmark Facebook posts. The two chrome extensions are: Facebook-Bookmark Posts and Facebook Favorite. Facebook Bookmark Posts: This one is my personal favorite. Just add this Chrome extension and you will see the “Bookmark” Option added to posts on your Facebook. Just tap on the Bookmark option present there, to save the particular post. After you install this Chrome extension, you will be able to see a Facebook logo added to your Chrome toolbar. Tap on the logo, and you will be able to see the links of the Facebook posts saved by you. Facebook Favorite : Similar to the above, this one is also a Chrome extension that adds an option called Favorite to the posts. And similar to the Facebook Bookmark Post extension, this too adds a Facebook logo, which when tapped on shows you the list of the posts that has been set as favorite by you. Click on the option that says Favorite, right below your posts, to add the post to the list of favorites. Apart from the traditional ways to save your Facebook posts, there is one more way to save the those worth reading posts posted on your Facebook wall. SocioClip is a popular website that let’s you save the Facebook posts. Step 1: The first step is to install the SocioClip extension for Chrome. After installing this extension, you will be able to see an option called “Clip it” added to every post that is on your Facebook wall. Step 2: The posts that you wish to “Clip” will be saved to your SocioClip account. Therefore, first of all you will have to get a free account on SocioClip. Now tap on the option that says “Clip it” below the post and it will open a small window that will require you to fill certain details about the post. After you fill in the details, tap on the Clip it Option to save the post to your SocioClip account. These are some of my favorite methods to bookmark Facebook posts so that I can get to them anytime I want to. There are some other complicated methods as well (like, you can share a post on Facebook, and then choose it to share the posts as a “Private Message”. That will have your posts saved in your in your Facebook inbox, till you want). But you don’t need to be bothered with those, especially when there are so simple methods available.